Newly renovated inside and out, this multi-building 9 bedroom, 6 bathroom compound is ideal for large families, reunions and wedding parties. This complex is located off historic Route 6A and within walking distance of a beautiful Bayside beach (Breakwater Landing, 1/2 mile), the famous Brewster Store (an authentic 1800's vintage general store), the Brewster Chowder House, the Woodshed (pub/bar), the Brewster Fish House, and the Brewster Coffee Shop (breakfast and lunch). There is nearby access to the Cape Cod Rail Trail, a 22 mile paved bike trail which extends from Dennis to Wellfleet. It is a perfect destination for large groups that want to spread out yet have separate and private accommodations on a spacious 1.1 acre lot landscaped with hydrangeas, roses and beach grasses. The main home has just been completely redone from the studs out and features: central air conditioning, a modern kitchen with granite, two all new full baths (one with 5' walk-in shower, one with tub/shower combo), 4 bedrooms (1 on 1st floor and 3+ on 2nd floor) and sleeps up to 10. There is a large family room and an adjacent front porch. The eat-in kitchen can seat up to 8. The home has a large deck and adjoining patio with loads of seating and eating areas for outdoor entertainment. Behind the main house is a two bedroom, ranch style home, which also has central air conditioning and features 6 rooms including 2 bedrooms. This home has been completely renovated including white Shaker style cabinets with granite counters. The home features a separate dining room as well as a kitchen eat-in area, a rear family room, and a large living room with a white wicker loveseat and sleeper sofa. 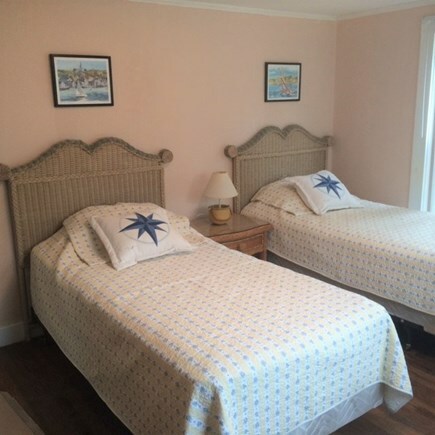 This house has two bedrooms - one with a queen bed and the other with a pair of twin beds. A private and sun drenched deck is located off the rear family room. 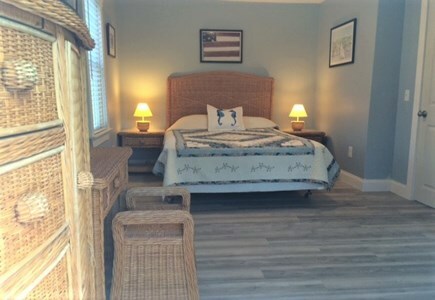 Additionally, there are two one bedroom cottages with new kitchenettes and new bathrooms that each feature a bedroom with twin beds and a living room. Last, there is totally rebuilt one room studio with a new kitchenette and bathroom. Like the main houses, each of the three smaller buildings have furnished outdoor spaces. Unlike some multi-building Cape rental properties where one house is in good condition and the others are, shall we say, ''rustic'', each building on this property is in excellent or new condition, so no one in your party gets the ''short straw'' in accommodations. All the buildings have HD tv's and WiFi access. Plus the multiple building configuration provides maximum privacy and quiet for both the early risers and night owls in your group. There is plenty of off street parking, yet the location allows you to not need a lot of vehicles given the walking distance to so many destinations. The property is a perfect hub for your Cape vacation given its proximity to numerous tourist destinations wedding/resort venues including Ocean Edge Resort (1.6 miles); Downtown Chatham/Chatham Bars Inn (10 miles); Wequassett Inn (6.4 miles); Harwich Port/Nantucket Ferry (7.6 miles); Orleans Center (5 miles); Cape Cod National Seashore (9.7 miles). There are several public golf courses and Cape Cod Baseball League fields located within 5 miles. 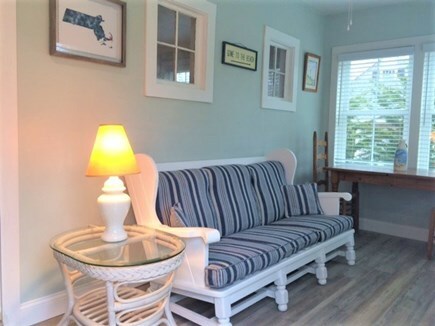 Each home is tastefully furnished in a ''Cape Cod'' style (soft colors, white bead-board, wicker and rattan furniture, artwork/prints of the Cape and Islands, etc.). The houses are complete with dishware, bedding and towels, a pair of washers/dryers, coffee makers and new appliances throughout. Additional availability info: Check-in time 4 PM, no exceptions; check-out no later than 10 AM, no exceptions. This is a Saturday to Saturday vacation rental. Additional pricing info: Cleaning/linen fee of $400/week; 10% discount per week for multiple weeks, State and local taxes of 14.45% will apply. Alan has been a landlord since he purchased his first home- a two family- in Plymouth Ma in 1977. He has owned vacation property on Cape Cod since 1988, primarily in the Harwich/Brewster area. 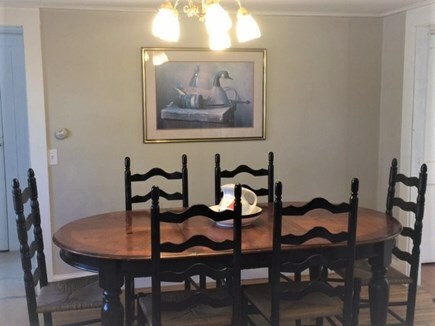 This property has been totally refurbished since its purchase in April 2018. 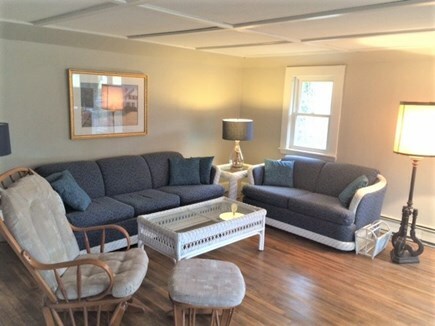 Previously utilized as a multi-tenant home and cottage colony with fences separating the units, it has been renovated as a compound with complementary landscaping, uniform exteriors with separate parking areas defined by split rail fencing and flowering shrubs such as rose bushes and hydrangeas. There are numerous places to congregate outdoors with each unit having either a patio, deck or porch. Some of the areas are set so as to provide quiet areas for reading and relaxation. You can walk to numerous eating, recreation, shopping destinations amidst the many historic properties located nearby. Brewster is conveniently located in the Lower Cape. There are plenty of conservation areas and trails for walks, nearby public golf courses, beautiful Bayside beaches featuring outstanding sunset vistas and views to Provincetown. Eating and drinking options range from famous roadside snack and ice cream stands such as Cobies to elegant dining at renowned Chillingsworth. The Cape Cod Rail Trail runs through the Town and links to neighboring Dennis and Orleans and beyond as well as connecting to Nickerson State Park and several clear water ponds.